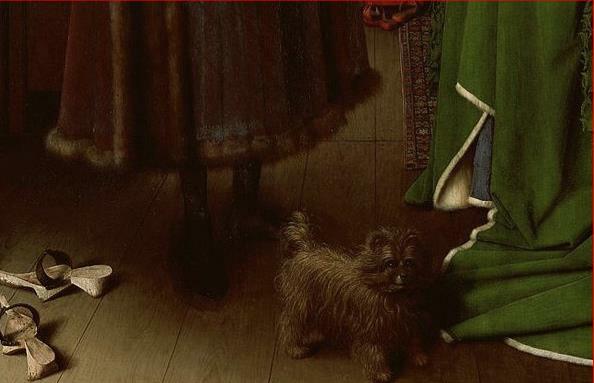 This postgraduate panel discussion constitutes part of the conference Arnolfini Histories: Jan van Eyck’s Arnolfini Portrait and its Receptions, organised in conjunction with the exhibition Reflections: Van Eyck and the Pre-Raphaelites, organised by the National Gallery, London, in collaboration with Tate (Sunley Room, National Gallery, 2 October 2017 – 2 April 2018). While much scholarship has been devoted to iconographic interpretation of the work, the identity of the figures, and the implications of the subject-matter, the things depicted in the room, rendered with such precision, have received less attention in their own right – apart from the famous mirror. This panel is designed to articulate the roles of the other things in the paintings. We welcome proposals for ten-minute papers on any object depicted in the painting except the mirror (although presenters may wish to explore the relationship between their chosen object and the mirror). We hope to include a wide range of approaches, including papers that consider the reinterpretation, or re-presentation, of these things by Pre-Raphaelite and other artists from 1842 (the date of the painting’s entry into the National Gallery collection) onwards.